When the domestic becomes a landscape. How does the action of dumping these textiles into the desert ecology compromise the integrity of the environment? How do artists respond with reuse or re-purposing these materials to construct another vision of our interior/exterior lifestyle? 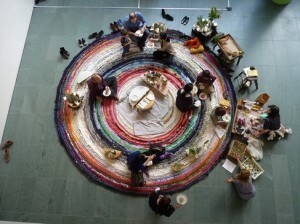 Los Angeles–based artist Fritz Haeg worked with Hammer Museumvolunteers and museum visitors to crochet discarded textiles into the traveling Domestic Integrities rug. After a call to bring shirts, towels and other textiles to the museum for use in an installation piece, the rug of local textiles becomes a charged site for testing, performing, and presenting how we want to live. Haeg’s spiral-stitched circular rugs gradually expand as they travel from city to city, place to place. Domestic Integrities surveys local and seasonal patterns and rituals of interior domestic landscapes, calling attention to the way that we use what we resourcefully find around us to thoughtfully make ourselves at home. Fritz Haeg, Domestic Integrities part A01: New York, 2012. Installation view at the Museum of Modern Art, New York. Photo: Jack Ramunni, Mildred’s Lane. With mounds of cast-off textiles littering the spaces we inhabit in the Mojave desert, what responsibility do we have to tend our landscape? What does this periphery blight say about the spaces we choose to focus on versus ignore? No longer perceived as cultural waste what other types of resources might this wasted domestic desert collage become?